Note: With the new view as of April 2012, we do not see such close-ups as shown in the pictures below. We can still sometimes see Mom's "part" or dark feathers on the back of her head, and the size difference when they are together. 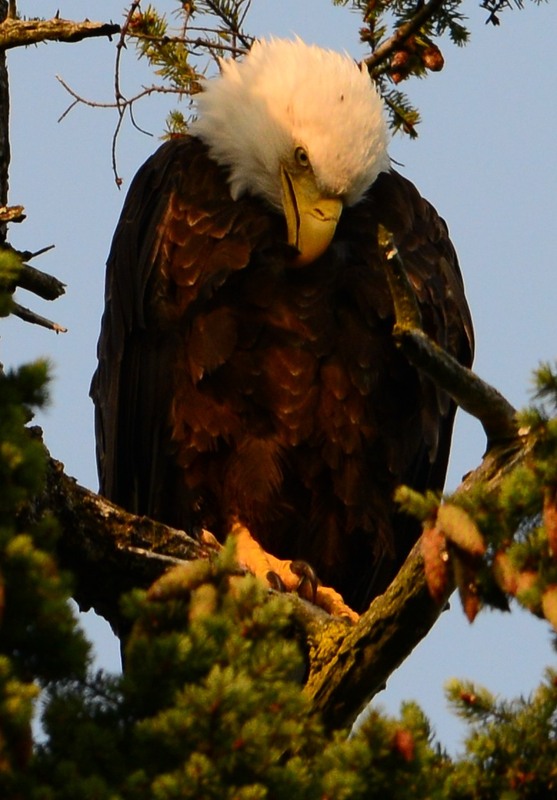 The question that arises most frequently throughout the viewing day is, “Who is that, Mom or Dad?” Identification is easier when both are on the nest because female bald eagles are about 25 to 30% larger than the males. When direct size comparisons cannot be made, we look for other clues. Mom Hornby (right) is larger than Dad Hornby (left). 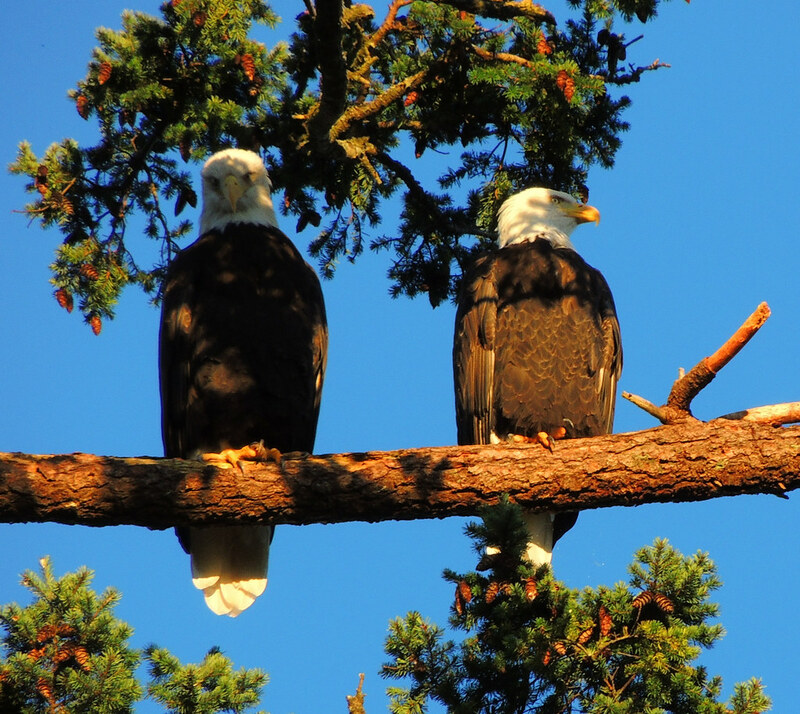 Male and female bald eagles are similar in appearance, both having white heads and tails and dark body feathers. The female’s beak is fractionally deeper and longer than the male’s and her toes and talons are also longer, but their sizes may not be useful identifiers if the birds are not side-by-side. Individuals can show variations in their feathers, particularly those of the head and “collar”. Happily for us, Dad Hornby’s head feathers often appear smoother and (as viewers frequently comment) “more groomed” than Mom’s. In addition, she has a distinctive part at the back of her head. Dad's legs are not as fully feathered as Mom's (Doug Carrick calls Dad "skinny legs"). These differences are not as noticeable when the birds are wet, when they have just flown onto the nest, or when it is windy, but they are the most commonly used identifiers. Mom's dark part is usually seen more clearly in the WA view, but is visible here. 24 and 27 March 2010. Plumage can also vary; individuals may have a dark or light feather in an unusual place, or lighter (often older, sun bleached) feathers on the back. At this time (Jan–March, 2010), Mom Hornby’s feathers appear lighter than Dad’s. 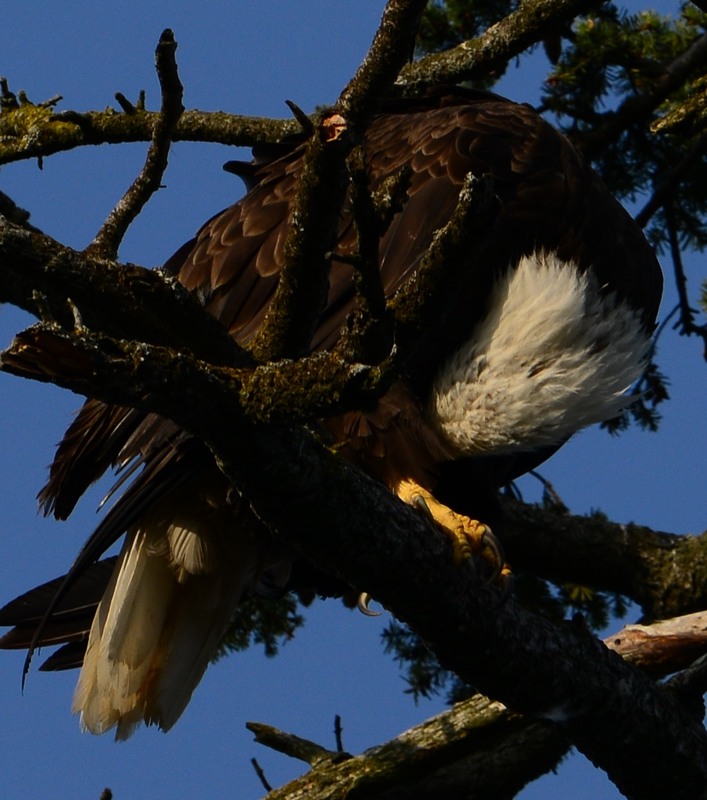 This year Mom's lower back feathers near the tail are very light coloured. This may change when she moults this year. 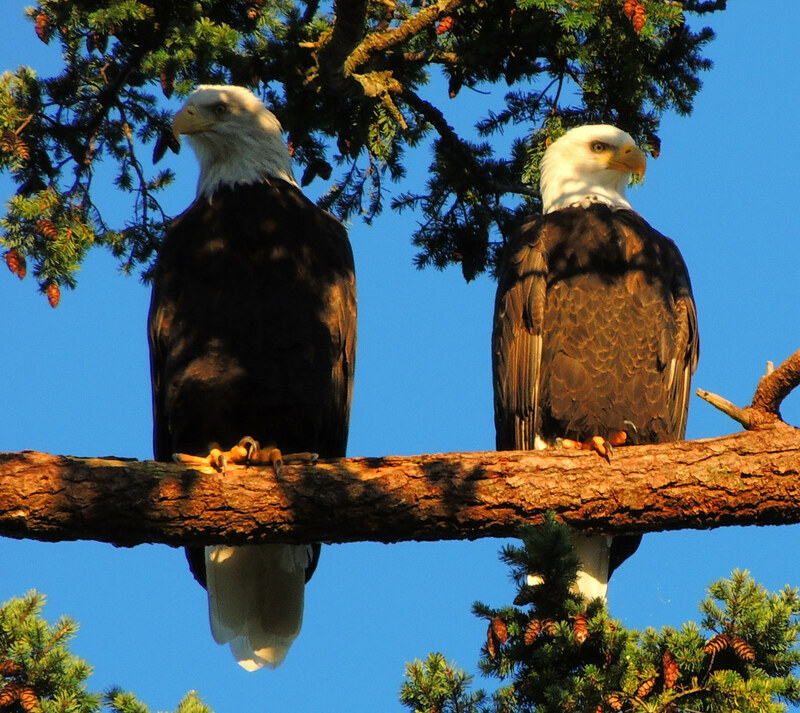 Left: Mom (left) has lighter feathers than Dad (sitting on the nest). Right: Mom on the nest. 23 March 2010. Does the tail tell the tale? 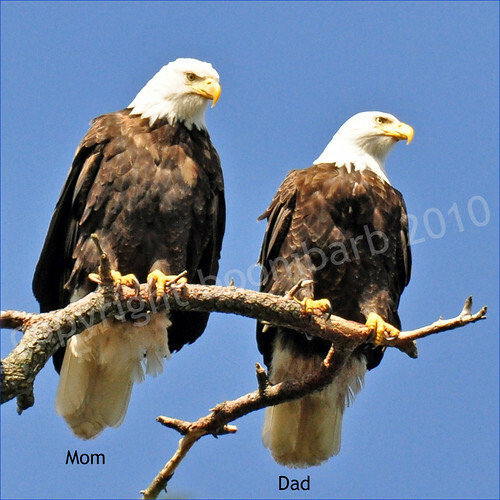 Doug Carrick notes that Dad’s tail looks more squared and Mom’s more rounded when they are perched or standing (see the first picture in this topic). AJL notes that when the birds are standing with wings folded back so that the primaries meet over the tail, Mom’s primaries reach further down the tail than do Dad’s. Above the touching primaries, part of her tail shows as a white diamond shape. This patch of white can also be seen on Dad, but his is a smaller area and is most evident when he is lying down. No attempts at identification are 100% accurate, but it is always good fun to guess ‘who is who’ and usually, we pool our observational skills to reach consensus. (We’re right 100% of the time however, when one of the Hornbys is laying an egg ). Placement of Dad*s top of head freckle. Good view of Mum*s back of head markings. Mum on the left, Dad on our right. This foto shows really well, the difference between Mum & Dad*s head feathering.